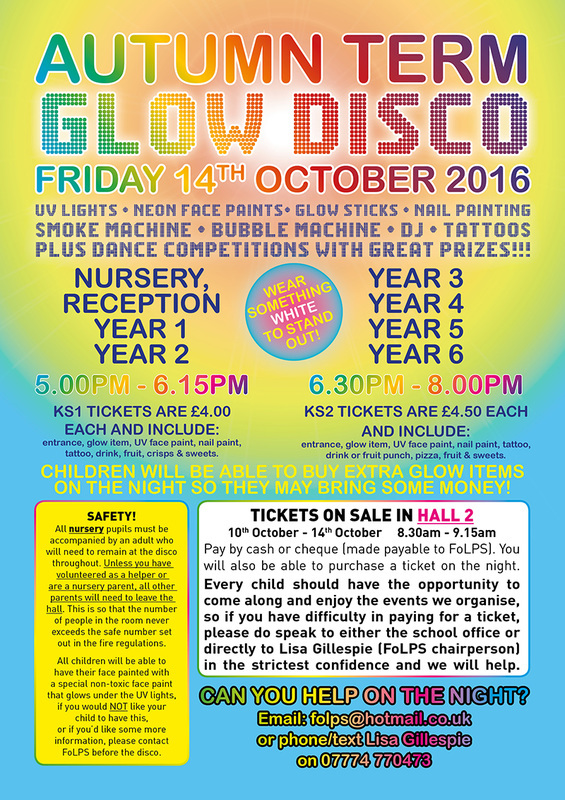 On Friday 14th October, 2016, we will be holding our Autumn Disco with a 'glow' theme! There will be UV lights, glow sticks, neon face paint, a smoke machine and a bubble machine as well as all the usual treats like nail painting, tattoos, dance competitions and a DJ. Tickets go on sale on Monday 10th October until Friday 14th October in Hall 2. Key Stage 1 (Nursery, Reception and years 1 and 2) tickets are £4.00 and include entrance, a glow item, UV face paint, nail varnish, tattoo, drink, fruit, crisps and sweets. Key Stage 2 (Years 3-6) tickets are £4.50 and include entrance, a glow item, UV face paint, nail varnish tattoo, water or fruit punch, pizza, fruit and sweets. Please remember that all nursery pupils must be accompanied by an adult who will need to remain at the disco throughout. Unless you have volunteered as a helper or are a nursery parent all other parents will need to leave the hall. This is so that the number of people in the room never exceeds the safe number set out in fire regulations. All children will be able to have their face/hand/arm painted with a special, non-toxic face paint that glows under UV lights. If you would NOT like your child to have this, or if you'd like some more information, please contact FoLPS before the disco. CAN YOU HELP ON THE NIGHT? !